You don't need a fully stocked gym to get a full-body workout. The Lifetime Ladder program ensures you can do this for a long time with increasing levels of fitness, and lowers the barrier of entry to anyone, no matter how fit you are right now. The program is organised around a "fitness ladder" with 48 rungs. Each rung prescribes a given number of repetitions of five exercises. The first 15 rungs constitute the Introductory Ladder and involve easier variants of the exercises in the Lifetime Ladder, rungs 16 through 48. The exercises are intended to be done every day. Completing all the exercises typically takes between 10 and 15 minutes. Spend one week on each rung. On a given day of the week, for example Sunday, try the next higher rung. If it seems as easy as the current rung felt the week before, move up to that level. 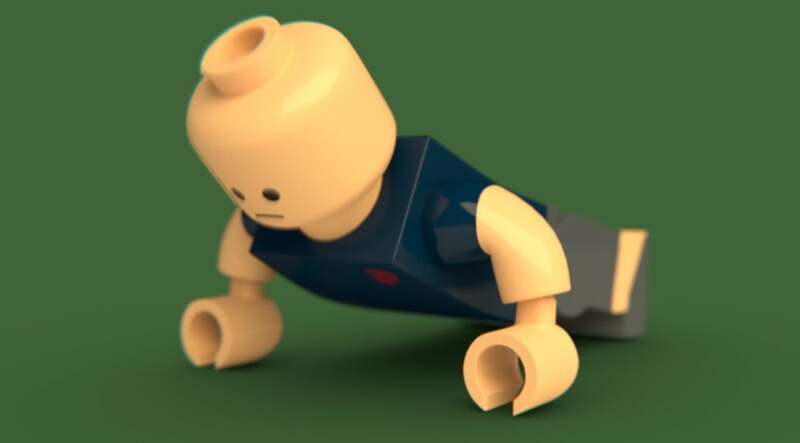 If you have difficulty completing any exercise of the new rung, or you can't complete it in 15 minutes, or you feel pain or exhaustion at that level, stay at your current level for another week. The Introductory Ladder starts you off with bends, sit-ups, push-ups, leg lifts, spot running and jumping jacks — don't worry, these are mild versions of how those exercises are usually done. The idea is that even if you are out of shape, you can do these by starting at the first rung and working your way up. 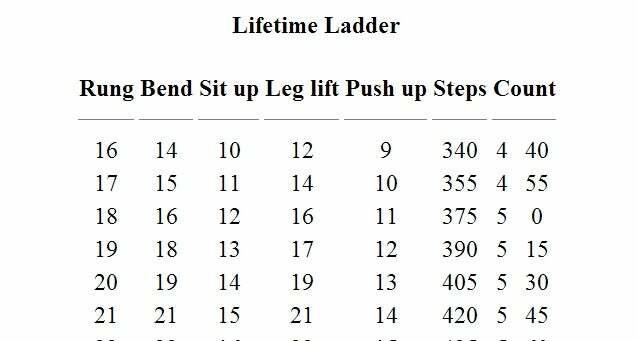 The full Lifetime Ladder exercise plan and details on how to do each exercise can be found at the link below. It's a long read, but make sure you go through it carefully before you start the program. This is completely lifted from the 5BX programming developed by Bill Orban for the RCAF in the late 1950's. Yeap they state that they adapted this from the 5BX program in the linked page. Also seems similar to the 7 minute workout. What exactly is it meaning by the numbers under steps and count? I tried to find where it explains it, but I couldn't. It looks like there's three numbers where there should only be two. "The general outlines for this program were derived from the Royal Canadian Air Force “5BX” exercise program for men. I originally used that program, but found it unnecessarily complicated and confusing for people, like myself, interested simply in achieving a reasonable level of fitness and maintaining that level throughout their life. The RCAF programs for men and women are entirely different: I know of no reason this should be. My program is self-paced, relying on your own body to tell you how far and how fast to advance. Thus it should work fine for women as well as men. (Of course, I'm male and I may be missing something. Both men and women should feel free to modify the program as you like. It's your body!) "